Falling in love with Sadie. Some cute puppies visiting the winery. I bet Daisy wants a little sister! 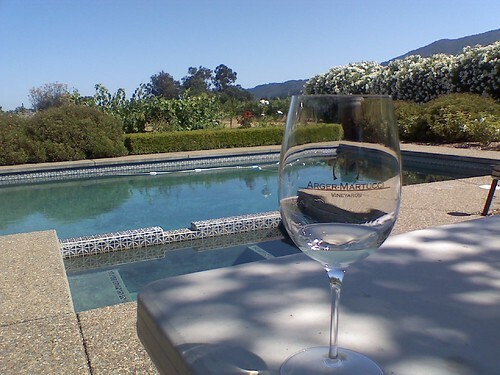 Chilling by the pool and tasting the 2007 Viognier. It’s from the Russian River Valley. Very fruit forward. I love following him on Twitter! What a patriot! If the Colbert Report is hiring producers/bloggers/groupies – I’d jump on that bandwagon. Colbert’s all about sharp writing, witty insight and rockin’ good time. I also enjoyed his show at Camp Victory. I thought it was wonderful what he did for the men and women serving in Iraq. And finally, some amazing observations on a Missouri Congresswoman and Fox News. Seriously, I had no idea Hurricane Katrina was a Dem. Did you? Comments Off on Celebrating The Greatest Day!